Jollytails Resort is pleased to offer puppy training. Classes use positive reinforcement - please bring with you treats your dog likes or a favorite toy. Items are also for sale at the store - we can help you choose the right training treats! Please no flexi-leashs / retractable leashes, choke collars or prong collars or head collars. Body harness are permitted. If you feel you need one of these items to control your dog, please speak with us about alternative tools. Puppies need at least their first set of shots (2nd preferred) in core vaccines. Visibly sick dogs can not attend. Class consists of 6 one hour classes over the course of 6 weeks. 2:00 PM - 3:00 PM - This class is full. 3:30 PM - 4:30 PM - Spots still available. Cost: $150.00 (+HST) for the 6 weeks which will also include a free clicker, treat pouch and class handouts. Email and phone support is provided for the duration of the class for any training issues or help. Registration: Please call 902.444.TAIL (8245) or email: info@jollytailsresort.ca to register. A registration deposit of $50 is required to hold your spot, with the balance due at the time of the first class. 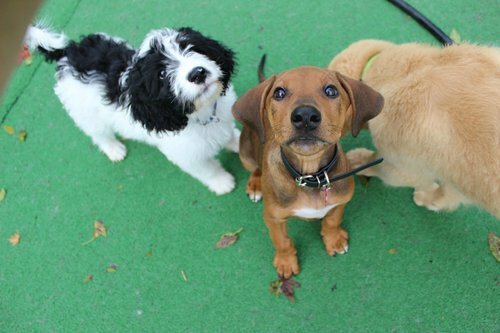 Puppy socialization is the single most important thing you can do for your dog! Experiences that happen to a dog during this critical period can stay with them their whole life. Attending a puppy class sets your dog up for success for the rest of his/her life. The majority of this class is run off leash with a strong focus on play and socialization with other puppies in a safe and controlled environment. Please read what the American Veterinary Society of Animal Behavior has to say about puppy classes HERE. Socialization to the world around them is critical for new puppies. One common mistake is that exposure to things isn't enough! You must ensure the puppy isn't afraid of the new experience and that you make it a positive. For a full list of things you should socialize your new puppy to and a detailed check list click HERE.